Like the diamond piece, the pearls in this piece originally belonged to Princess Charlotte Amalie. In 1840 Christian VIII’s queen Caroline Amalie ordered the piece re-modelled and the rubies were added. This is the last of the crown jewel pieces still in use by the Danish queen. 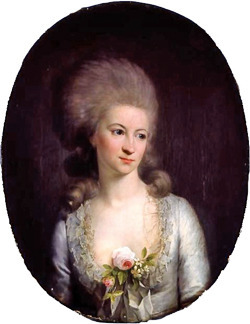 Caroline Amalie of Schleswig-Holstein-Sønderborg-Augustenborg. 1830 by Aumont. 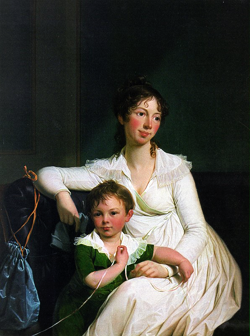 Caroline Amalie was married to Christian VIII, son of Juliane Marie’s son Prince Frederick. Since Frederick VI had no sons, Christian VIII was crowned upon his death. 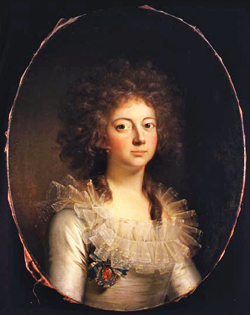 In a twist of fate Caroline Amalie’s uncle was also Frederick VI. 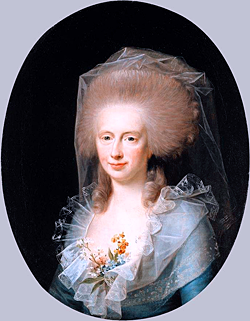 The mother of Caroline Amalie is Princess Louise Augusta, the daughter of Queen Caroline Mathilde. Louise Augusta’s story is an interesting one that I will post about at a later date. 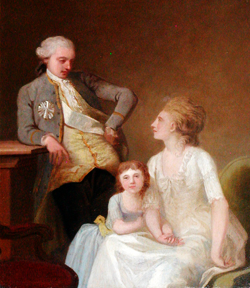 Although the old king had accepted Louise Augusta as his legitimate child, rumours persist that Louise Augusta was actually fathered by Johann Struensee who once upon a time ruled in the king’s stead. 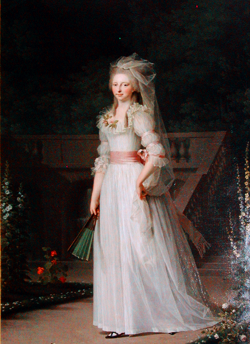 Since these rumours were never confirmed, there was no hindrance for Caroline Amalie to become queen consort. Caroline Amalie and Christian VIII were the last Danish monarchs to be crowned, and since their reign the Danish crowns (which I will post about later) have been safely packed away beneath Rosenborg Castle. 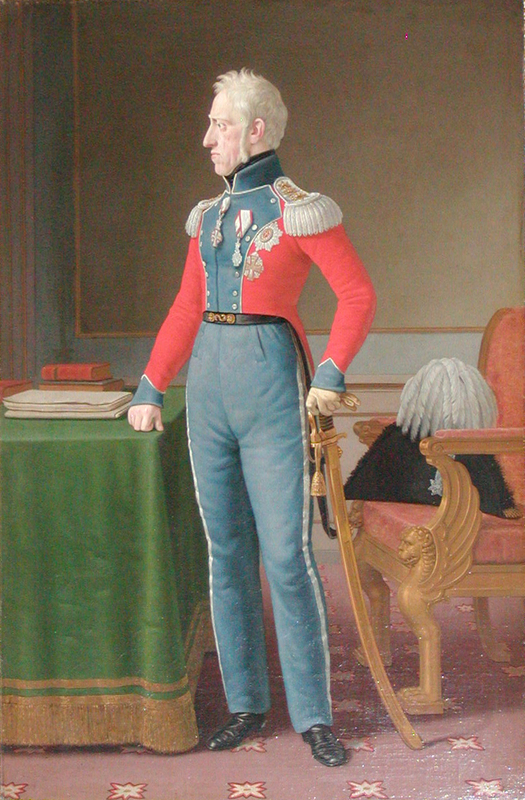 Their sucessor, Frederik VII was the king who gave the Danes a democratic law and ended 400 years of supreme royal rule. 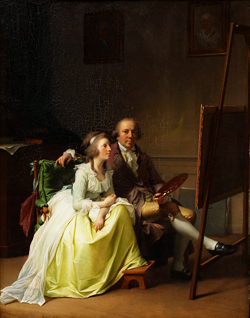 In a way, this couple were the beginning of the end for the old monarchy. Soon, there would be no more supreme rule and soon the role of the monarch would constitutional one. Caroline Amalie is also the queen that gave these four pieces their current shape, but the notion that parts of these pieces are from the 17th century is a sweet one. 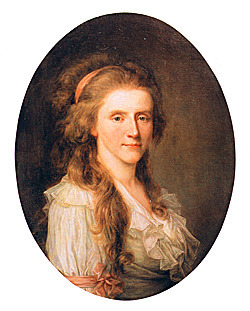 It could be said that her nose is more Struensee than Christian VII but who can really say?